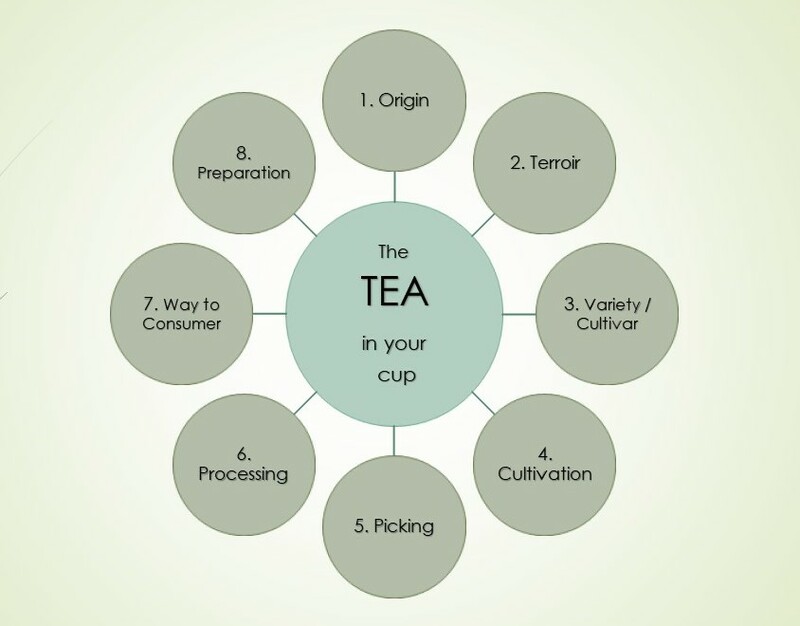 Number 6 of the 8 factors influencing the identity and quality of the tea in your cup is the tea processing. Now, this topic is way to comprehensive to cover for in just one lesson. Therefor, we structure the topic in 8 sub-topics and ditribute their exploration on 8 individual lessons. The first of these lessons deals with the early history of tea processing, up to where tea became tea as we know it – the tea in your cup! Tea as we know it and in all its variations was not invented in one day. In fact, millenniums have passed from the first ever consumption of a tea leaf to tea in your cup. However, the venue where this development took place remained unchanged for most of this time – ancient China. 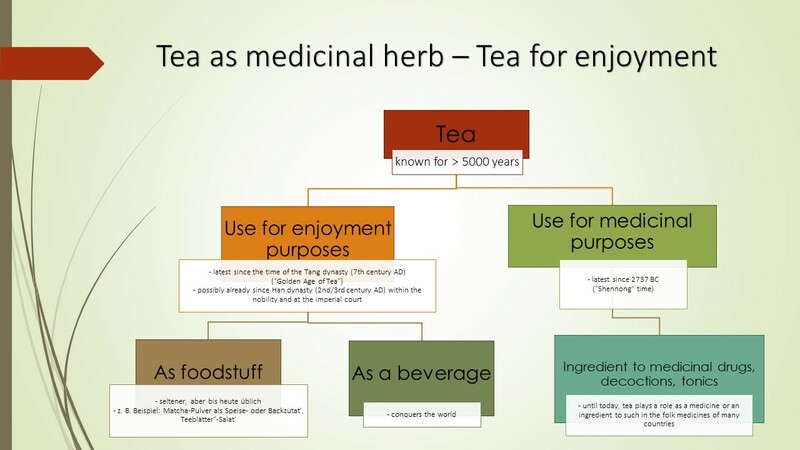 We do know that in China tea leaves were used for medical purposes already 5,000 years ago. The early processing of tea leaves in decoctions or pastes for the production of medicines is historically proven. What we do not know, due to the lack of written records from such ancient time is when exactly people started to drink tea for mere enjoyment purposes. As to that, it is likely that tea leaves found their way into food early on. But it is also well conceivable that people already were (nearly) as far as we are today thousands of years ago already, throwing tea leaves into – hot or cold – water to produce an invigorating and tasty beverage. On any account, legends such as the story of the discovery of tea by the Chinese emperor / herbalist Shennong and their pictorial representation suggest this. If so, it was freshly picked tea leaves that were used for that purpose. Because, what they didn’t have 5000 years ago in China either, were methods to preserve them. And the development of such is basically, where the known history of processing tea for drinking purposes begins. 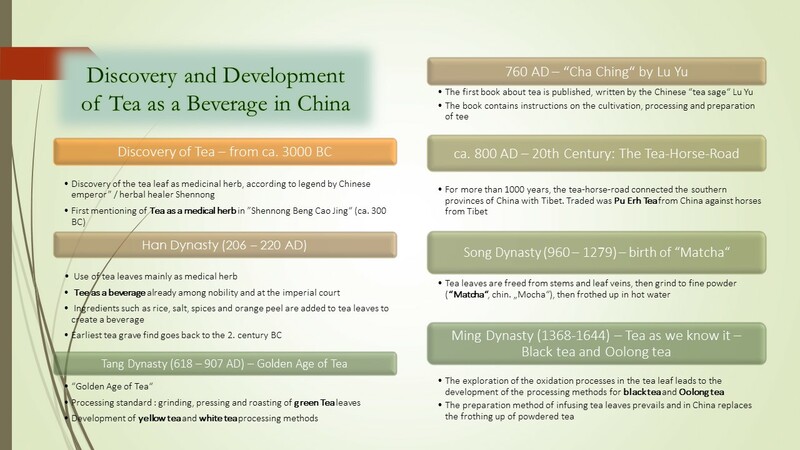 The early history of tea processing is a history of green tea processing. on that score, it is known that already in 4th or 5th century, tea leaves were already steamed after picking, crushed in a mortar and then pressed into cakes or bricks. Also during the so-called “Golden Age of Tea”, the Tang dynasty (618-907), this was the standard of tea processing. The pressed powder tea of that time was prepared by boiling in hot water. However, drinking tea in ancient imperial China was a privilege of the imperial court and the nobility. In 760 AD, the Chinese “tea-sage” and protégé of the imperial court Lu Yu wrote and published the “Cha Jing”, the “Classic of Tea”. In his work, the author describes cultivation, picking and preparation of tea, as well as the ways of tea processing of his time. Towards the end of the first millennium, a specific tea processing method that lives on through today was develeoped in the Chinese province of Yunnan. To produce what we call pu erh tea today, tea leaves were heated for preservation and then pressed into cakes or bricks. Via trade routes such as the ancient tea horse road, this was the first tea to reach regions outside of China, including Tibet and the Middle East. Assumably, the roots of the processing of white tea and yellow tea also are in the late Tang Dynasty. Anyway, there’s prove for the use of both methods in the Song dynasty (960-1279). Now, tea leaves are already available as whole leaves and without any pressing. However, the people of that time continue to powder thee leaves for preparation. Unlike before, however, the powder is no longer cooked. Instead, frothing it up in hot water is the new method of preparation. Little later, this method found its way to Japan along with the first tea seeds. There, the custom of pulverizing and frothing-up green “matcha” tea (Chinese: “Mo Cha”) has persisted until today. The tea in your cup as you know it came about in the era of the Ming Dynasty (1368-1644). At that time, the imperial court began to promote the processing of tea leaves as a whole leaf. As a result, the pressed powder tea began to vanish and soon entirely disappeared from Chinese tea culture. Instead, the tea leaves were now prepared in hot water just as we still do today. 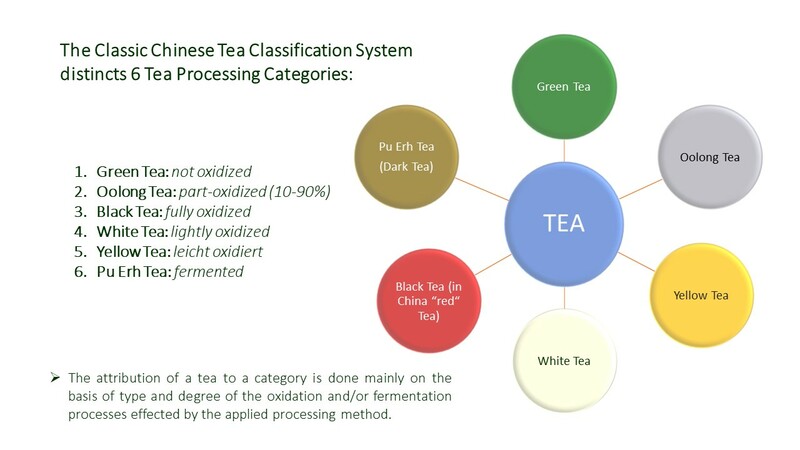 You will learn more about this system, its attribution parameters and the sequence of each category’s elementary processing steps in the next lesson of My Little Tea School – The ABC of TEA.